We're just in the planning stages right now but this is going to an official event with the full support of Aeon Marine/Beavertail Skiffs. The location will definitely be Matlacha, FL and it will happen sometime in October or early November. This will be an all-release, inshore tournament and is open to the owners of any Beavertail or Aeon boat. We're going to keep the entry fee low, hopefully around $50 per person, and will include a great awards dinner, a silent auction, and lots of raffle prizes. We'll have a lot more details hammered out over the next week or two but if you're interested please feel free to contact me right now at gmckee1@hotmail.com or 239-565-2960. Hope to see you there. To update my last report from the Matlacha side, the weather suddenly turned fantastic and the sea trout have been coming out of the woodwork. I spent the last three days fishing in Pine Island Sound with some of my regular anglers who all wanted to have their neighbors over for dinner. That meant loading up on the trout filets and it was remarkably easy each morning. The miles of grass flats to the west of Pineland were full of upper-slot sized fish like the 20 incher pictured above that my buddy Gerry Fischer landed on a white Gulp shrimp. It was so easy hooking these guys that we didn't really bother doing anything else. No complaints about that from me. It seems like someone just threw the switch and reset our winds right back to winter-like conditions. This weekend's charters experienced a lovely mix of high clouds and 15 knot gusts from sunrise to sunset. The water temps dropped 5 degrees back into the upper 60's and extra low tides kept most of the fish in the choppy open water instead of the more sheltered creeks and bays. Despite all that, we still managed to bring in a fair amout of trout every morning. Live shrimp and 3" Gulps under corks did the trick over the grass in 3 to 4 feet of water all around the power lines in the south part of Matlacha Pass. I even had a couple of determined fly fishermen who managed to land some nice 18" trout on Clouser Minnows and white deer hair patterns. We also popped a few nice snook but I couldn't even rent a redfish in the pass. Several guys I talked to did really well with the reds in Pineland area and my Dad and his buddies managed a nice slot-legal slam just outside of Burnt Store on Saturday. If you were tough enough to head out this weekend you probably did pretty well for yourself. We've got falling tides all week so I'll be hitting the deeper flats over in the Sound. I need to get back after the reds. A pair of bald eagles have nested on one of the mangrove islands just north of Matlacha each winter for several years now. They always hatch at least one chick but just the other day I floated by their nest and three heads popped up to look at me. Mom and dad were close by but kept their distance while I took some photos. This is the first time I've seen this many chicks in an eagle's nest and even though I doubt all three will survive, it's a very cool thing to have just a few minutes from the dock. Hello from Pine Island. Sunny days and warm water means hot fishing in South Florida but I’m sure it beats shoveling snow. This past week has been a little windy but the sheepshead reports have been good. Jim Booth and family have reported good action on the redfish pass wall and docks. The Boca Grande docks and Roosevelt Channel are also producing good fish. Large trout from 18-26 inches have also been reported. Doug Spoelstra landed a 24 inch trout on a green Mirrodine scented with Menhaden Pro Cure scent. Rapala Skitterwalkers, the Heddon Super Spook Pup, Gulp shrimp, and Zoom Super Flukes are also doing well. Good Redfish action is still being reported all around Pine Island. Bob Lomeo reported a 27incher on Mirrolure 17mr out of Flamingo Bay. And just a word of warning, make sure you are using at least 30 lb test fluorocarbon while fishing this time of year. We have heard of large Snook being hooked this past week. I have been using 15lb Trilene as my winter leader up on the flats. You only get so many chances in the spring to catch really big snook. Don’t get caught with light leader when ole bucket mouth shows up. It can get depressing when grouper season closes in February for offshore fisherman. Don’t be sad, just adapt. You can still practice catch and release or better yet, challenge yourself at some species that you may have been overlooking. We had a great time offshore the other day catching large triggerfish and porgies. Snapper fishing is still a little slow. Anxious offshore snapper fisherman including myself can’t wait to land a large Mang or Yellowtail this season. However, you should only try this night fishing if you don’t value sleep. Our next free fishing seminar will be March 16th at 6:30. Cast net throwing lessons, Tarpon fishing in the bay, and Boca Grande pass fishing will all be covered. Capt. Cory Mcguire and Capt. Nelson Diaz will be our guest speakers. Lastly, Old Pine Island Marina will be hosting the First Annual Blind Fishing tournament on Saturday April 28th. We are in desperate need of about 12 boats with a skipper and mate. (skippers don’t need to be a professional) The tournament will be 4-5 hrs. long. There will be a barbeque following with awards. If you have a boat and are willing to give up a ½ a Saturday for a good cause, please call me and I will put you on the list. Thanks for making Old Pine Island Marina your tackle store. Mathew McKee's first fish, January, 2009. I’ve had a lot of impressive anglers on my boat over the past fifteen years but some of my most memorable trips have involved kids. I’ve seen some incredible things like a twelve-year-old jumping a 150 pound tarpon off Bokeelia or almost landing a world record permit on fly down in the Keys. But it’s the real young ones on their first flats trip that I look forward to fishing with the most. I’ve always allowed my customers to bring their children along on a charter as long as they’re at least five years old and can wear the mandatory life jackets. Since most of my fishing is done in less than three feet of water I feel totally comfortable doing this and I love being able to introduce them to some of the amazing things that swim in our waters. At the same time, young children can be tricky and restless on a small boat like my 18 foot Beavertail so it’s important that they enjoy the experience right off the bat. Here’s a quick rundown of what I try to do when I have a kid onboard for their first fishing trip and really want to hook them on the sport. The most important thing is a no-brainer: catch them something and do it quickly. Kids need bent rods and it really doesn’t matter to them what species is doing the bending. A pinfish is as impressive to a five-year old as a blue marlin if it’s the first thing they’ve ever caught. Even the bait stealing puffer fish that we adults hate can make a kid scream with joy when they blow up on the deck. In other words, don’t waste time looking for tailing reds when on the flats when a pile of catfish are sitting right near your dock. Here in the waters around Pine Island a big school of ladyfish is manna from heaven when I have children on the boat. I actually think these are the perfect species for kids because they do just about everything. Ladyfish will jump, run, pull really hard, and they even poop all over the deck, which most kids seem to find hilarious. On top of all that, since we don’t eat ladyfish so you get a chance to demonstrate some catch and release. Of course if you really want to give kids a thrill just chop up a ladyfish (something that boys especially love to watch) and toss a hunk out for sharks. When I was guiding in the Keys and had a kid on board I was always shark fishing. Kids just love everything about it, especially seeing that unmistakable shape circling the boat. The species of shark doesn’t matter. The sluggish nurse sharks are just as much fun as anything when the drag is cranked down and they’re thrashing at the surface. Nurse sharks are also a lot safer to let kids touch when you leader them next to the boat. Here around Pine Island our most common sharks are the much more dangerous bulls and blacktips, so that’s an added thrill but not one I ever let anyone try to pet. If the bite slows down and my young passengers start to get restless there are a few other tactics I turn to in order to channel that energy. A full baitwell is like a mini touch-tank at the aquarium. Kids love to play in the baitwell and mine has a clear lid that can’t accidentally slam shut. I always keep several dozen live shrimp in there and I also like to toss in a couple of pinfish and declawed blue crabs to let them chase around with the dip net. When my three year old nephew Matt was down from Pennsylvania for the first time playing the bait well was the highlight of his fishing trip. He landed his first catch, an awesome six inch pinfish, and then it was right back to messing with the shrimp. It never fails. Kids also like to play in the tackle box if they get bored but you obviously don’t want them handling anything sharp like hooks or lures. I keep that gear safely stowed but I do leave out a clear Plano box full of dozens of different soft plastic baits. I let the kids pick out their favorite color if we’re jig fishing and the realistic DOA’s are especially fun for them to play with. Even after they spend an hour getting everything mixed up in there, they always seem to enjoy putting the baits back in order for me if I ask them to. Who knew tackle could be so much fun and such a great distraction? Finally, when the kids are clearly ready to quit, we quit. Some can easily handle a full day’s fishing trip but most can’t. Forcing them to sit through even one extra hour on the boat when they’re already hot and restless will only make them forget all the fun they had at the beginning of the day. A four hour charter seems to work best and that’s also more than enough sun for most children. The idea is to send them home tired but not exhausted. And most importantly, send them home wanting to come back for more. If you do that, you’ve got an angler for life. My friends at Aeon/Beavertail will be hitting the huge Miami Boat Show this week. Stu Apte will be there with his new BT3 on all four days and my good buddy Capt. Mike Bartlett will be coming up from Key West on Saturday. Owners Liz and Will Leslie will be on hand with their boats at space 3371 outside the Convention Center starting on Thursday. Stop by to check them out and say hello. If you've never been to the Miami Boat Show before, cancel your plans for the weekend and just go. It's absolutely insane. It might be a pain to get there and costs about $35 for admission but if you like to fish or love boats you have to do it at least once. You'll have a blast. I haven't fished for the last three days thanks to the temps being in the 40's in the mornings. Here's a true story I wrote almost five years ago when I lived and fished in the always warm Caribbean. My wife and I had just parked our Jeep and were walking down Encampment Beach to one of my favorite bonefish flats around 4 o‘clock in the afternoon. I didn’t think I had much chance of catching anything, it was windy, late in the day, and the tide was too high. None of that mattered at the time. I just wanted out of the house after witnessing the end of Penn State’s disastrous excuse for defense against Ohio State. We were less than twenty yards from the road when I spotted someone climbing over the rocks that mark the beach’s western end. He was clearly a local, an older man wearing torn jeans and a long sleeve shirt despite the heat. What he was carrying up the beach made my jaw drop. He had a three foot piece of driftwood over his shoulders and hanging from each end, tied by a short length of sturdy crab trap line, were two huge silver fish. From a hundred yards away I easily recognized their unmistakable shape as a species I’ve spent the last twenty years chasing in both Florida and Puerto Rico. They were permit, each well over twenty-five pounds and nearly three feet in length. They’re one of the most elusive and difficult fish to catch anywhere in the world, especially on a fly rod. I’ve had anglers come to Vieques from as far away as Sweden to chase permit without success, and here came two prime examples up the beach, hanging from a piece of bamboo. I stopped the man immediately and started hammering him about his catch. “Where did you catch them, what kind of bait did you use, and can I take your picture?” were a few of the questions I managed to spit out in amazement. His answers surprised me even more. He caught them just past the very flat I was heading to, where I’d seen many but never hooked a single permit in over two years of trying. His bait was a hunk of conch tossed out on a simple hand line with twenty pound test; he’d probably never used an actual rod and reel in his entire life. The fish he was taking home were actually two out of the three permit that he had caught during the morning, the first one got away. What really stunned me was his lack of excitement at a catch that had this full time fishing guide going through the roof. Hooking a single permit is the very essence of a perfect day on the water. Back in my Key West days, where they’re a lot more common, catching three permit would get you mentioned in the sports page. The fisherman in front of me, with fifty pounds of these fish hanging off his shoulders, looked as excited as someone coming home from the grocery store. He was probably a Dominican, judging from the Spanish he spoke, and as I finished taking his picture I couldn’t help marveling at the real differences between us as anglers. I was carrying the newest Sage fly rod and reel worth nearly $1200 retail, while he had an old hand line, often called a yo-yo, that sells for about $3 at the hardware store. I was wearing a pair of $180 polarized sunglasses to help cut the glare and spot fish, he was wearing none. I had on a new pair of Teva booties to protect my feet from the sharp coral and sea urchins, he was barefoot. Finally, he was the one walking away with two incredible fish, and I knew I’d be going home empty before I even started casting. He was eager to get home with his catch so I took a few more quick photos and said goodbye. Back in Key West, where I’d catch dozens of permit each year, I never thought to bring one home for dinner. Killing a permit, the holy grail of fly fishing, is a huge taboo among the guides and anglers up there. When a permit agrees to be caught on a fly it must be cherished, photographed, painted in watercolors, and written about poetically after its safe release. 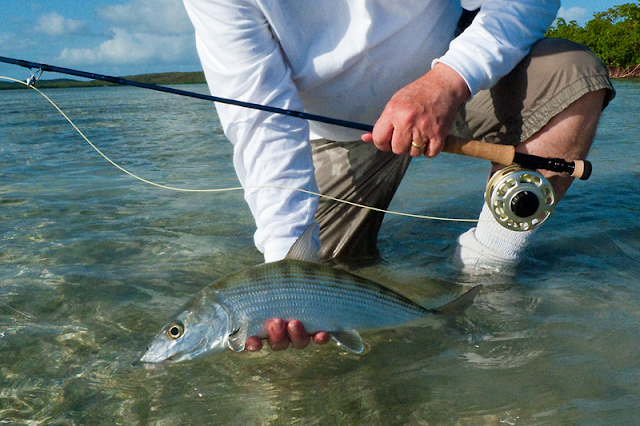 Catching permit in the Keys elevates the guide and angler to a higher plane in the sport. You become the elite of the elite. Eating one is pure sacrilege. This isn’t the case down here in Vieques and I’m actually happy about it. Permit are great eating and the two being carried up the beach would feed his family well that week. After almost two decades of looking at the permit as a nearly mythical creature, it was a bit of a shock to see them for what they really are; just another fish in the sea. My high tech gear and I came home empty that afternoon. We were shown how it’s done by a hand line, a hunk of conch, and a clearly superior fisherman. The newest skiffs from Beavertail got a lot of attention at last weekend's Florida Sportsman Expo and one of the reasons was their price. These boats can easily be ordered for almost $10,000 less than the 18 foot models built by their competitors at Maverick or Hell's Bay. A base model BT3 starts at $27,500. A complete package like mine, pictured above with its Yamaha F70, Power Pole, Yeti Cooler, 80lb. Minn Kota remote trolling motor, Garmin GPS and trailer, is $36,000. If you want to go crazy and check all the boxes on the order form you can get a boat just like Stu Apte's 90 horsepower Signature Series pictured below for $41,500. Stu has just about everything Beavertail offers for this boat but the BT3 is still rated for a 115HP motor. If you want to hit 52mph with one of these skiff it will only cost you an extra $750. I've had my new boat for just over two months now and have run more than three dozen trips on it. Every one of my charters immediately comments on how great it looks as soon as they step on board. They're even more impressed with the quality and dryness of the ride, especially running across a stiff chop in Charlotte Harbor. As a guide, owning this new Beavertail is a no-brainer. The factory is located right up the road and they're great to work with during the construction of your boat. The owners of the company, Will and Elizabeth Leslie, personally answer the phone when you call them. That doesn't happen with too many other boat builders. For my money, the BT3 is still the best 18 foot flats boat on the market. If you're in the market for one and would like a free test ride just give me a call at 239-565-2960. Angler Russ Johnson sent me this photo today of a perfect bonefish he caught while fishing on my old stomping grounds of Ensenada Honda on Vieques. Russ was fishing with Capt. Franco Gonzalez who is still the best flats guide in all of Puerto Rico. Glad to see that the bones are still biting down on my favorite flat on Earth. I've finally got back on the water after a very busy week of boat shows and business with Beavertail Skiffs. The last two days started off with great low tides but overcast skies. We had lots of tailing redfish on the flats north of Matlacha but getting them to eat was a trick. Canadian angler Keith Browne scored on the nice 22 incher in the top photo with a Gulp shrimp right as the tide started flooding around 9AM. My charters also landed a handful of decent trout on topwaters and flies but the really big reds avoided me. The good news is that the clouds seem to part after a few hours each morning making it really pleasant to be out on the flats. Water temps are now in the low 70's almost everywhere and that's great news. February is an excellent month to fish down here and the bite will keep getting better each day. I'll be at the Aeon/Beavertail booth all weekend with my new BT3 so stop by and say hello. You can click here for a $3 discount coupon. Hope to see you there. Here's some shots I just took of the latest boat to roll out of the Beavertail factory up in Palmetto. You can see it in person at this weekend's Florida Sportsman Expo and meet Stu Apte there, too.